There’s a new Kindle on the block, the Kindle Oasis, and it’s Amazon’s most expensive e-reader yet. But does a higher price tag mean a better product? We researched to help you decide if you should spring for the new $290 Oasis or opt for the $200 Kindle Voyage, which was the most advanced Kindle until the Oasis splashed down. What we found: Amazon kept some features the same in both the Voyage and the Oasis. Both Kindles have a 6-inch screen, 300 ppi resolution, 4GB of on-device storage and a glare-free display. What you’ll learn: The Oasis is $90 more expensive than the Voyage, but that $90 will give you features the Voyage lacks, like a removable charging cover, page-turn buttons and a significantly longer battery life. Amazon reimagined the look of the Kindle with the Oasis. Although the two Kindles are similar in size, the Voyage lacks the physical page-turn buttons on the right-hand side of the Oasis’ screen. The new e-reader also has a tapered design — meaning that it’s thicker at the bottom, to provide a better handgrip, and thins out toward the top, reaching 0.13 inch in thickness. Also unlike the Voyage, the Oasis comes with a removable black, merlot or walnut charging cover. 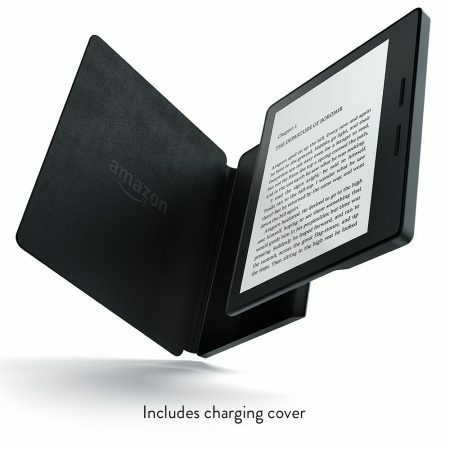 It wraps around the e-reader, opens like the cover of a book and can recharge your device while snapped on. Both e-readers have a 6-inch screen. They each also have a built-in light, but the Oasis has 10 LEDs compared with the six LEDs of the Voyage. But getting lost in your favorite reads from Harper Lee or Stephen King is a function of more than just your e-reader’s size and appearance. Ample storage. Both Kindles have 4GB of on-device storage. That means you can hold thousands of books, plus enjoy free cloud storage of all Amazon content. App compatibility. The free Kindle app is available for other tech essentials like your phone or tablet, bringing Kindle books to your other devices. Synchronized reading. You can start a book on one device and finish it on another, thanks to Whispersync technology. This keeps your spot saved across all of your Kindle reading devices. Adjustable viewing. These e-readers promise a glare-free read in any lighting environment and allow you to customize text size. A large library. Amazon promises a “massive selection” of books at low prices for Kindle readers. In fact, there are more than 1 million available for $2.99 or less and upwards of 2 million for $9.99 or less. Dual battery system. The Kindle Oasis can last for up to eight weeks on a single charge with its recharging cover. Compare that to the Voyage, which can last up to six weeks on a single charge. Battery life will vary for both based on usage and light settings. Push to turn the page. Oasis users can turn pages using either the touchscreen or the Kindle’s convenient new page-turn buttons on the front of the handgrip section. The Voyage uses PagePress technology, allowing users to press the screen to turn a page. The Kindle Oasis starts at $289.99. That’s $90 more than the Voyage, which starts at $199.99. Keep in mind that the standard versions of both of these models come with something called Special Offers. These are product recommendation and deals — essentially ads — that will be displayed on your Kindle’s lock screen. To forgo these advertisements, you can buy Kindle models without Special Offers for $20 more. Also important to note: Standard Kindles are Wi-Fi only. If you’d like your Kindle to connect to 3G as well as Wi-Fi, you can opt for the Wi-Fi plus 3G version for $70 more than each particular model’s starting price. With price tags in the hundreds of dollars, we recommend purchasing either of these products with a rewards credit card that can earn you cash back to maximize your savings. If you’re a bookworm who’ll be using your e-reader regularly, the Kindle Oasis will definitely satisfy your needs. It’s an amped-up version of the Voyage that’ll give you the features you need whether you’re at home or on the go. But for more casual readers, the Voyage is still sufficiently loaded with features, if you can make do without page-turn buttons, a slimmer design and a charging cover. Of course, these aren’t your only Kindle options. The basic Kindle starts at $79.99, while the Kindle Paperwhite starts at $119.99. 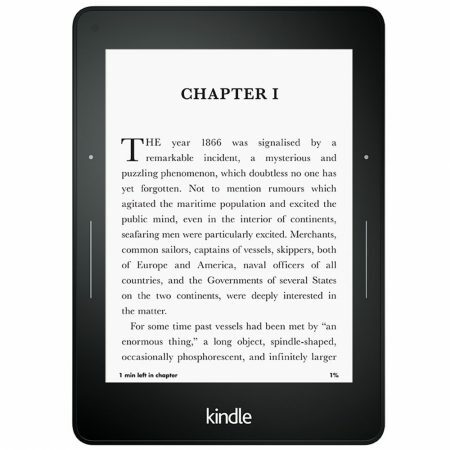 We recommend that you weigh all of your options before selecting the right Kindle for you.